Tutors are current students, alumni and community members, many with degrees, who are committed to providing academic support to WVNCC. Faculty and staff also assist with Tutoring Program services. Individuals employed as tutors demonstrate exceptional achievement in content areas, knowledge of learning theory/skills, a commitment to service and a belief in the value of education. Tutoring is a FREE service provided to all WVNCC students. 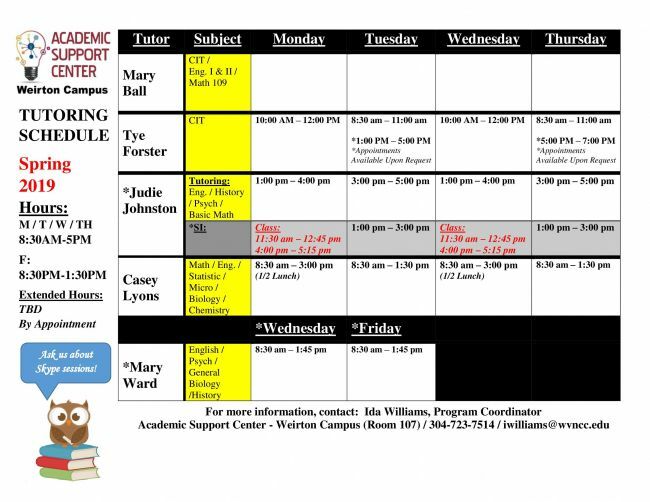 The ASC Tutoring Program on the Wheeling campus is a drop-in program - appointments are not necessary - click on the link at the left, month-by-month, for a current tutoring schedule by subject, for each campus. Some tutors may also have limited appointment availability. For more information, call: 304.214.8923. 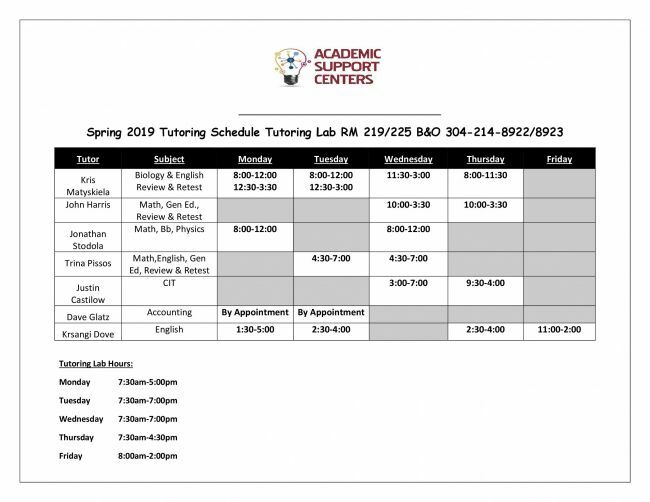 For more information about the tutoring programs on the Weirton and New Martinsville campuses contact Ida Williams (304.723.7514/WRT) or Dennis Bills (304.510.8773/NM). The WVNCC Tutoring Program is always looking for high-quality tutors to join its ranks. If you, or someone you know, has an interest in tutoring at WVNCC, please contact Tutoring Coordinator, Stephanie Smith, at 304.214.8922 or ssmith@wvncc.edu. Tutoring is a part-time, paid position. BRAINFUSE CAN HELP YOU SUCCEED. PERIOD. Can't get to an ASC for tutoring? Need a tutor at 10 p.m.? Brainfuse is the answer! 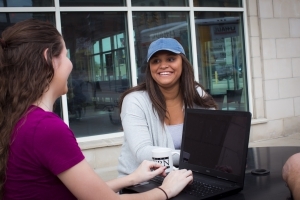 Brainfuse is an online tutoring service available to all WVNCC students free of charge. Registration is quick and easy. Brainfuse can be accessed through the Student Portal. The OWL Online Writing Lab at Perdue is an excellent resource for all paper writing needs. Khan Academy Brief, accessible tutorials on a variety of subjects, including math and science. How To Study.Org Excellent resources for discipline specific studying and more!!! ACCUPLACER TEST PREP A little bit of preparation time can yield big results!!! TEAS Test Prep 150 free TEAS practice questions that match the style and format of the actual test!!! HESI A2 Super easy to use with detailed video review for different sections of the test. SchoolShelf All the tips and strategies you need to succeed in college, neatly accessible in one place!